Here's a little tradition that was started a few years back. 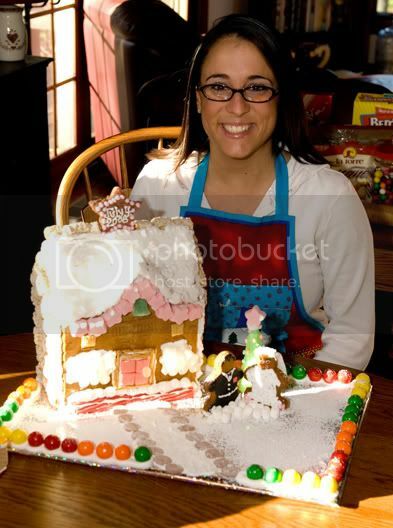 My mother hosts a gingerbread-house-making-event the day after Thanksgiving. Girls only! Here's a photo of this years builders. From left to right we have Lisa(my sis. She usually has one of the better houses, ha), Amanda(my sis-in-law. She took a few years off, but came back with a nice little house. ), Gina(cousin, she might still be putting the finishing touches on her house), Katie(cousin, She unfortunately made a RedSox themed house in a Yankees household!! we'll let it slide this year), Sara(cousin, was a little tardy today but put together a nice house, ha), and last but not least, Deana(my fiance, she went with a wedding style house in honor of our upcoming wedding in July.) Check out the little bride and groom near Deana's house.